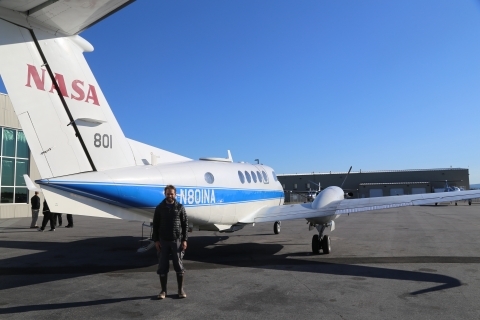 UNC hydrologist Tamlin Pavelsky stands in front of a NASA KingAir B200, which houses the AirSWOT suite of instruments. Scientists including Pavelsky are using AirSWOT to provide new measurements of surface water and ocean topography, which help them understand the movement of water around the planet. AirSWOT flights are being conducted in preparation for the SWOT satellite mission, which will launch in 2021 and make similar measurements for the whole globe. When you listen to Tamlin Pavelsky talk about his childhood, it sounds a bit like the beginning of a great adventure novel. He grew up in the backcountry of Alaska in the 1980s — in a cabin with no electricity or running water. “We didn’t get a telephone until I was 7,” he says, chuckling. As a teenager, Pavelsky spent his summers just north of Denali National Park — about 10 miles from the infamous bus where Chris McCandless died — helping his dad build a log cabin. Far removed from the distractions of television and technology in general, Pavelsky cultivated a deep love and appreciation for the wilderness from an early age. He especially enjoyed those summers near Denali, when he and his dad would break from their labors and hike a few miles to where the Sanctuary and Teklanika rivers converge. Today, the UNC hydrologist continues to find himself fascinated by water — so much so that he wants to measure all the rivers in the world. That’s why he got involved with the Surface Water and Ocean Topography (SWOT) mission when he was a graduate student in 2004. Today, SWOT brings together U.S. and French hydrologists and oceanographers who want to better understand the world’s oceans and its terrestrial surface waters. “There are anywhere from 2 to 4 million lakes in the world,” Pavelsky says. “We monitor just a few thousand of them.” Pavelsky wants to measure changes in water storage in lakes and rivers, as well as variations in how much water flows through rivers over time. In addition to his fascination with water and its movement, Pavelsky has always had an interest in looking at the Earth from above. “My mom gave me an atlas when I was 6,” he recalls. “I would spend hours poring over it, looking at all the mysteriously named towns and mountain ranges all over the world.” In graduate school, he wanted to translate this love of aerial views using satellite images to study the earth’s waterbodies. “I can go out into the Alaskan wilderness and study a lake. But if I want to study all the lakes in Alaska, the only possible way to that is with satellite images. If you live in the United States and you’re interested in that, you go to NASA,” he says. In 2002, he applied for a three-year fellowship with the space agency and became part of a collaboration between NASA and CNES (the French government space agency). Using a satellite called SWOT, researchers will produce the first global survey of Earth’s surface water, observe the fine details of the ocean’s surface topography, and measure how water bodies change over time. It’s not set to launch until 2021, but when it does a rocket loaded with a 4,500-pound satellite that will travel into space. Upon reaching zero gravity, it will begin a three-month-long period of unfolding. The process is similar to that of a butterfly emerging from its cocoon — it’s slow and steady, beginning with the release of the solar panels and then the deployment of a 33-foot-long boom that separates the satellite’s two radar antennas. Once the satellite unravels, its antennas send out a roundtrip radar pulse aimed at the surfaces of the world’s waterbodies, which will reflect the pulse back to the satellite. Until then, Pavelsky has plenty to keep him busy — one project involves measuring the width of every major river in the world. He and graduate student George Allen can do this using a software application developed by Pavelsky called RivWidth. The program uses satellite images to figure out where the rivers are, and then maps the center line of the river as well as every point along that centerline to determine how wide the river is. Starting from that data, Pavelsky and Allen can also estimate the total surface area of the world’s rivers. That information is vital because rivers carry a fair amount of carbon. “They are actually supersaturated in carbon,” Pavelsky points out, “and release methane and carbon dioxide into the atmosphere.” To understand the carbon cycle, he wants to know how much carbon dioxide is coming out of rivers. So far, he and Allen have published their North American data, which revealed that there are about 20 percent more rivers and streams on the continent than predicted previously. This map shows the width of North American rivers wider than 100 meters. Pavelsky and his graduate student George Allen discovered there are about 20 percent more rivers and streams on the continent than predicted previously. Data collection like Pavelsky’s provides valuable information when it comes to problems like drought — something North Carolina is all too familiar with. This data can be especially helpful to someone like environmental sciences and engineering professor Greg Characklis. His research focuses on identifying the frequency and severity of drought, how it affects water supply, and developing innovative strategies that reduce this impact. For example, in North Carolina, he’s working with the Orange Water and Sewer Authority (OWASA), the Town of Cary, Durham Public Utilities, and the City of Raleigh to help them understand how they can more efficiently manage the region’s water sources. “Right now, those four utilities operate nine different reservoirs, and have a number of different treatment plants and pipelines that connect their cities,” Characklis explains. “In the past, they’ve mostly operated independently. We’re trying to help them understand how much more efficient it might be for them to work together to service the region.” This strategy could significantly reduce the cost of providing a reliable water supply to the region — particularly during drought. Each year, snowpack builds up throughout the rocky, jutting peaks along the more than 250-mile-long Sierra Nevada mountain range — the source of about 30 percent of California’s water supply. As temperatures rise and the snow begins to melt, it flows down the craggy foothills into rivers and reservoirs, usually in the summer, when it’s needed most by residents. Pavelsky and Characklis want to observe the food, energy, and water “nexus” that occurs in this mountainous region, and are working with colleagues from Cornell University and the University of California, Davis to try to secure funding for a project. Pavelsky wants to study the impact of snowpack while Characklis will develop plans to help these areas more effectively manage their water and financial risk during times of drought. In California, reductions in snowfall and precipitation result in less surface water runoff and reductions in hydroelectricity production from dams, causing the state to fall back on the more expensive alternative — natural gas. “So, the price of electricity can rise at exactly the time that farmers need more of it to pump groundwater because there isn’t enough surface water available,” Characklis says. “As a result, their pumping costs can rise dramatically, putting farmers in a very difficult financial position.” He and Pavelsky want to understand how, over the next 30 to 50 years, water resource availability and energy generation will change in the Kern and San Joaquin River basins. Tamlin Pavelsky is an associate professor of global hydrology in the Geological Sciences Department within the UNC College of Arts & Sciences and an affiliate faculty member within the Institute for the Environment. Gregory Characklis is a professor of environmental sciences and engineering in the UNC Gillings School of Global Public Health and director of the Center for Watershed Science and Management within the Institute for the Environment.